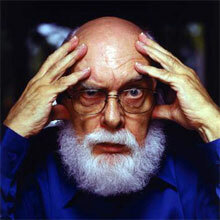 The Amazing Randi has weighed in on the 2012 nonsense, taking on ABC for a "News" story about how the Mayan Calendar was miscalculated, so the 2012 doomsday is canceled. In his typical acerbic no-holds-barred style, he excoriates ABC for the way that they reported this story, without even mentioning the steaming pile of sinking nonsense the entire "2012 doomsday" actually is. There is no Mayan Apocalypse and ABC “News” never hints at this. The Mayan Long Count calendar is built in great long ages and the last one they really bothered with just happens to end (maybe) in December of 2012. They never got any further because they were too busy having their culture wiped out, a topic that would make a much better story than the last page of the Farmer’s Almanac bringing on Universal Armageddon. Read the entire article at Randi's site.